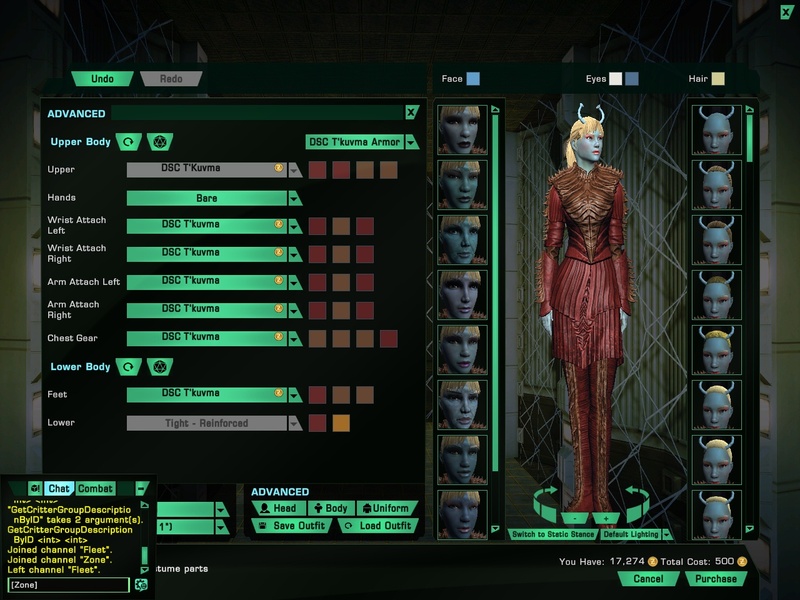 now, under the sci/mw officer, it has the same option - both Uniform and this new Tr: unrestricted, but DOESNT switch her outfit to something else. I really hope this highlights the need for massive QoL attention the tailor needs. I have the same issue. Ditto on all of the above. Same, was working on release but getting the bug described in the OP as of today's patch. Tried deleting/reclaiming KDF MW Boff but no change. What? I didn't even get to play with that, yet. LOL!! Having the same issue, too. I also noticed the boots option for this outfit went missing on females. More like typical. And I still have one character that can't access the Spectres mission thread. Well...I am still busy chasing Omegas. I will be very sad if this isn't fixed by the time those are gone for another year. Because that is the time I have penciled in for playing with new costumes....uh, and checking my "Available" tabs on various characters, and sort through more posts in Kit Modules thread.... LOL! 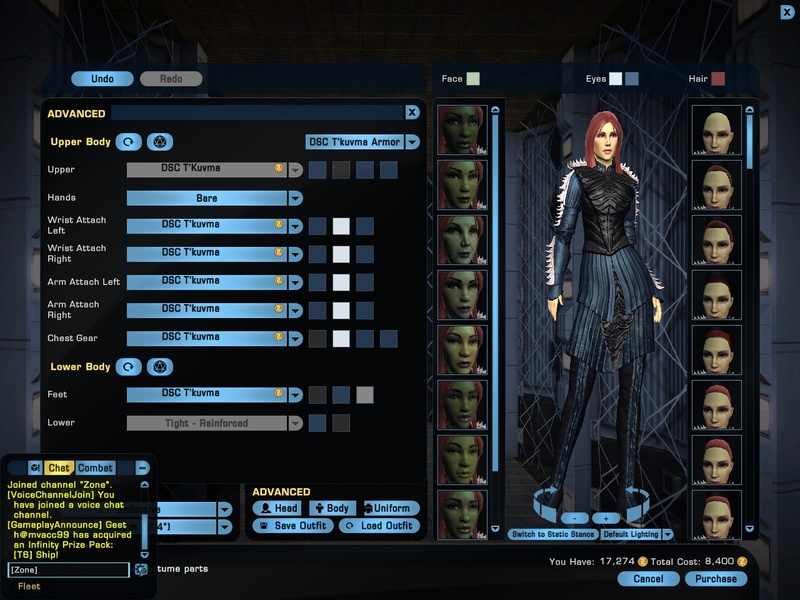 I can't even equip the T'Kuvma outfit on my female Klingon. All I get access to are bracers. Welcome to bugs online were we only fix the bugs you like, and will ignore the ones you hate. 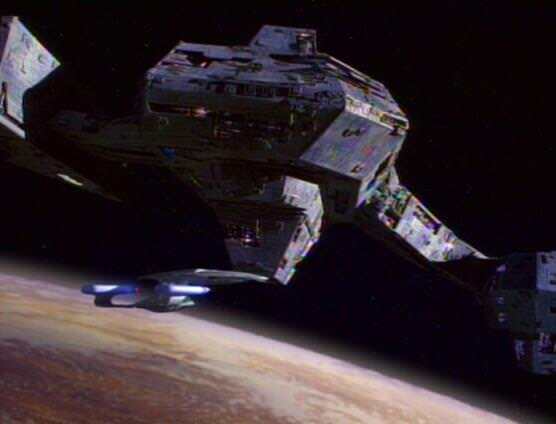 These are the voyages of the USS Farmville. Her 5 year mission is to boldly farm where no one has farmed before. Yea, wish I had known about this issue before I made my purchase. I would've definitely waited until it was fixed. Yeah, but by then the sale would be over. Most likely. This game has sales all the time. There will be another chance to get the discount. I would've rather wait for another sale if it meant all the items in the pack would work. Still bugged. As of today post maintenance. Tr: unrestricted still there. House T'Kuvma out fit bugged, cant keep the boots on the Sci/MW Boff if you go to edit. Also on the right arm assc. i now have a DSC Kor option ive never seen before. Its little spikes down the arm. no option for the other arm though. I do like it, its nice. Your point on the uniforms is fair enough. For me, I wasn't as interested in the uniforms as much as the ships and other items. the DSC House Kor uniform doesn't have anything on the other arm IIRC, I'm guessing they're gear up to add that outfit to the game. Awww, well, this is too bad. But, that's the way the cookie crumbles. I have something to do instead, at least, as they made the Anniversary Extension into a weekend event, so will have to reschedule time to play with costumes. Not really interested in the armor but it should be under DSC T'kuvma Armor. Love that color combo. Though, I sure wish it had the extended palette on it. And just as I suspected...looks nicer on taller characters. I need a taller character. Does it look better on the male forms? Boots are there when edit. but not on the Sci/MW klingon female BOFF, whom the outfit comes with. re-bumping just to get eyes back on it, as of 4/11/19 outfit still not working on the DIS Miracle Worker BOFF, boots default and the T'Kuvma boots arent a option to change it back to correct.